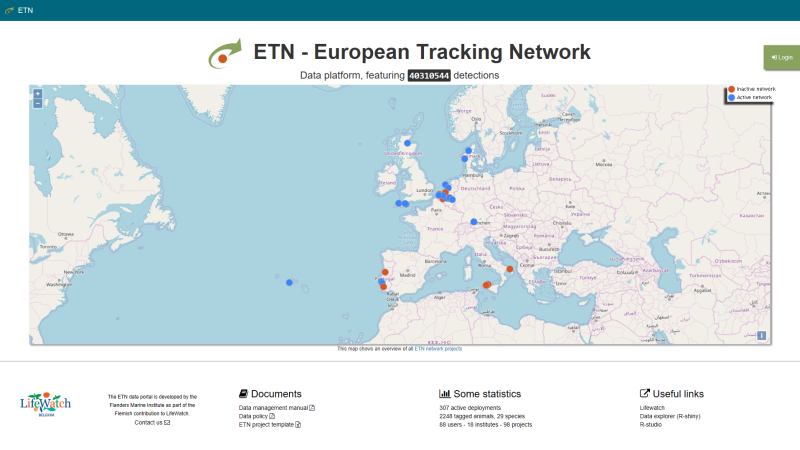 The ETN data management platform is an online web application to store, access and share aquatic telemetry data and metadata. The portal is open to all European users for data management of telemetry data in marine, estuarine and freshwater environments. ETN now contains data of 15 fish species. Currently ETN supports acoustic telemetry data, but aims to extend this to different telemetry techniques (e.g. PIT data-storage tags and satellite tags) to be able to monitor habitat use and migration patterns of a range of species in the aquatic environment. On a technical note, the portal requires the receiver and deployment metadata, as well as the transmitter tag and animal metadata before detection data can be uploaded. The uploaded data are subjected to quality control. Access is password protected and data moratorium rules are in place. The ETN data portal is developed by the Flanders Marine Institute (VLIZ) as part of the Flemish contribution to LifeWatch. New developments and additional features are added on a continuous basis. The web application is built using PHP (using the Symfony framework) for the back-end side and Bootstrap/jQuery/Datatables/… (among others) to facilitate the development of the front-end side.